... then please post a note in this thread. Please note that this is for the actual authors/packagers only. Please don't nominate someone else's app for inclusion. Developers/packagers, you can list up to 10 apps in a single post, but please don't continuously add new apps to one of the top 10 comments and please don't remove apps once they are crossed out. Once a post is within the top 10, we will whittle it down and then move on to the next post. 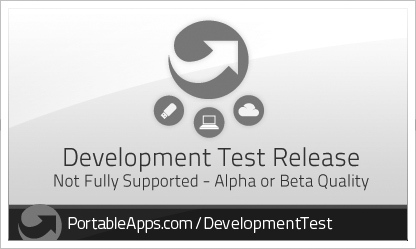 Follow the current PortableApps.com Format™ specification. Use the current PortableApps.com Installer (see PortableApps.com Format™ specification for details). Posts will be removed as the apps are released. Apps that are not in PortableApps.com Format and ready for official release on PortableApps.com will be removed from this thread. We won't be releasing Java or .NET apps just yet. Java we're waiting on licensing finalization with Oracle and will shortly have the only fully legal portable Java implementation which we'll work apps from. .NET apps are awaiting the new app directory which will have a special section for apps requiring .NET which will be hidden by default and include information on why it won't work on most public PCs (which are XP and have no .NET installed at all). Note: This topic was originally retired but has been revived and we've been having developers pickup and revise some older apps that never made it to release. We're working on the newer postings quicker, but the old ones are getting picked off one by one as well. is ready for release. How can I proceed?